Hi there, welcome back. This is our AutoDesk Inventor Tutorials for beginners series, and this particular article is part three about the setting up the grid in AutoDesk Inventor. We’d left off learning how to adjust the snap increment settings for both the x and y directions, and that these values don’t have to be the same. We make these adjustments from the Tools tab, Document Settings window, Sketch tab. Let’s take a look at the right side of the Sketch tab dialog window. On the right of this dialog window are the settings areas for the grid display. The grid display is set by the number of snaps. In other words we have 2 snaps per each minor line, and 8 snaps per each major line. If we were working in the metric environment, we would have, for example, snap increments set to 1, 5, and 10. Let’s close this dialog window. Once you have the Line tool active, and you mouse over the grid, you can see your snap points previewed in dashed line and yellow dots. If you left-click to place your point when you see the yellow dot, then you will accept this snap-to value and place your point at the snap point. This concludes our lesson about working with the grid in AutoDesk Inventor. We hope you enjoyed this next article in our series of AutoDesk Inventor Tutorials for beginners by Video-Tutorials.net. Stay tuned for our next article. We will be releasing our AutoDesk Inventor Tutorials Surface Design & Modeling course in a couple days and that’s what I’ll be writing about next. 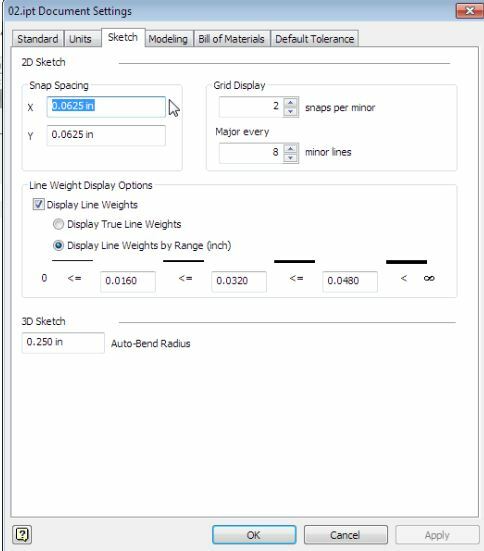 For many sample free AutoDesk Inventor Tutorials, please visit our YouTube channel at http://www.youtube.com/videotutorials2.